Spacewalker Akihiko Hoshide rides the International Space Station's robotic arm to a work site on the space station's backbone-like truss during a spacewalk on Sept. 5, 2012. This story was updated at 2:03 p.m. EDT. Two spacewalking astronauts successfully replaced a vital power unit on the International Space Station today (Sept. 5), defeating a stubborn bolt that originally delayed the fix with the help of some improvised tools made of spare parts and a toothbrush. NASA astronaut Sunita Williams and Japanese spaceflyer Akihiko Hoshide performed today's spacewalk repair — their second excursion outside the space station in less than a week. The fix-it job in space was actually an extra spacewalk tacked on to their mission after the stuck space station bolt prevented the astronauts from properly installing the power unit, called a main bus switching unit (MBSU), on the outpost's backbone-like truss last week on Aug. 30. The International Space Station has four 220-pound MBSUs that harness power from the outpost's solar arrays and distribute it throughout the orbiting complex. Without the use of one unit, the station had been unable to relay power from two of the eight solar arrays on the massive orbiting complex. "Looks like you guys just fixed the station," astronaut Jack Fischer radioed from Mission Control at NASA's Johnson Space Center in Houston. "It's been like living on the set of Apollo 13 the past few days. NASA does impossible pretty darn well, so congratulations to the whole team." 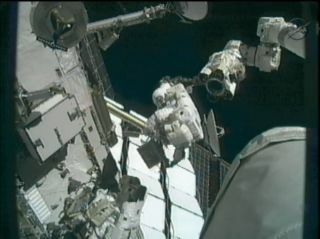 At the beginning of today's spacewalk, Williams and Hoshide removed the MBSU from where it had been temporarily tied down with a tether last week. The duo then spent several hours troubleshooting the unit and the two bolts that are designed to secure it in place on the space station's truss. After undoing the bolts, the spacewalkers examined them for possible damage, and inspected the corresponding receptacles on the MBSU for debris that was suspected to be inside. Spacewalking astronauts Sunita Williams (left) and Akihiko Hoshide (right) work outside the INternational Space Station near the outpost's robotic arm on Sept. 5, 2012. The spacewalkers used improvised cleaning tools and a pressurized can of nitrogen gas to clean out the metal shavings from the bolt receptacles. "I see a lot of metal shavings coming out," Hoshide said as he maneuvered a wire cleaner around one of the bolt holders. Williams and Hoshide then lubricated a spare bolt and manually threaded it into the place where the real bolt was eventually driven, in an effort to ensure that the receptacle was clear of any debris. Following last week's failed attempt to install the replacement MBSU, mission managers, engineers and veteran spacewalkers worked around the clock at NASA's Johnson Space Center in Houston to devise ways to fix the stuck bolt, NASA spokesman Josh Byerly said in his live spacewalk commentary. Part of their brainstorming included fashioning tools from existing supplies on the orbiting complex for Williams and Hoshide to use to remove debris from inside the bolt housings. One of the cleaning tools used today was made from a spare toothbrush. As the spacewalk approached the four-hour mark, the astronauts were given the option to proceed with installing the MBSU, or clean it off and bring the unit inside the station for more analysis. The two spacewalkers unanimously agreed to continue on with their work. "I think we can press," Hoshide said. "Get 'er done." "Copy get 'er done," Fischer replied. When Hoshide reported that the troublesome bolt was finally locked into place, the flight managers in Mission Control erupted in applause. "That is a little slice of awesome pie," Fischer radioed to the crew. Spacewalkers Sunita Williams (left) and Akihiko Hoshide (right) work near the International Space Station's solar arrays on Sept. 5, 2012. Last week, Williams and Hoshide removed a faulty MBSU and tried to install the spare, but they were unable to drive in one of the bolts that secures the unit to the station's truss. After repeated attempts failed the astronauts were forced to wrap up their marathon spacewalk. The Aug. 30 spacewalk lasted 8 hours and 17 minutes, making it the third longest spacewalk in history and the longest one ever performed by a space station crew. With the MBSU secured in place, the spacewalkers went on to remove a faulty camera from the station's Canadarm 2 robotic arm, and replaced it with a new one before returning into the Quest airlock and ending the spacewalk at 1:34 p.m. EDT (1734 GMT). Today's outing was clocked at 6 hours and 28 minutes, and was a record-setting excursion for Williams. Roughly two hours into today's spacewalk, Williams overtook Peggy Whitson, a veteran spaceflyer and former Chief of the Astronaut Office, as the record holder for the most time spent working in the vacuum of space by a female astronaut, Byerly said. Today's outing was the sixth for Williams and the second spacewalk for Hoshide, who is only the third Japanese spaceflyer to work outside in the vacuum of space. The International Space Station is currently home to six astronauts: Williams and Joe Acaba of NASA, Hoshide of the Japan Aerospace Exploration Agency, and Russian cosmonauts Gennady Padalka, Yuri Malenchenko and Sergei Revin.